Interstate 35 (I-35) is a major Interstate Highway in the central United States. As with most interstates that end in a five, it is a major cross-country, north-south route stretching from Laredo, Texas, at the Mexican-American border to Duluth, Minnesota, at Minnesota Highway 61 (London Road) and 26th Avenue East. The highway splits into Interstate 35E and Interstate 35W in two separate places, the Dallas–Fort Worth metroplex in Texas and at the Minnesota twin cities of Minneapolis–Saint Paul. At 1,568 mi (2,523 km), Interstate 35 is the ninth-longest Interstate Highway following Interstate 94, and it is the third-longest north-south Interstate Highway, following Interstate 75 and Interstate 95. Even though the route is generally considered to be a border to border highway, this highway does not directly connect to either international border. I-35's southern terminus is a traffic signal in Laredo, Texas, just short of the Mexican–American border. Travelers going south can take one of two toll bridges across the Rio Grande and the Mexican border, either straight ahead into the Juarez-Lincoln International Bridge, or via Interstate 35 Business through downtown Laredo into the Gateway to the Americas International Bridge. To the north, I-35 terminates in Duluth, Minnesota, with connections to Canada from the interstate's terminus via Minnesota Highway 61 to Grand Portage, or north to the border at International Falls, Minnesota via U.S. Route 53 in Duluth, but that route is more typically accessed from the south by Minnesota Highway 33 at Cloquet, Minnesota. In addition to the Dallas-Fort Worth and Minneapolis-Saint Paul areas, the major cities that I-35 also connects to include (from south to north) San Antonio; Austin, Texas; Oklahoma City; Wichita; Kansas City; and Des Moines. I-35 northbound begins at a traffic-signaled intersection with Business Spur I-35 in Laredo, Texas, just north of the Rio Grande and the international border between Mexico and the US. It has a 17-mile (27 km) concurrency with U.S. Highway 83 (US 83). Through Webb, La Salle, and Frio counties, it has a mostly north-northeastern course, turning more northeastly around Moore. It then cuts across the corners of Medina and Atascosa counties before entering Bexar County and San Antonio. I-35 is named the Pan Am Expressway in San Antonio. There, it has brief concurrencies with I-10 (with it US 87) and I-410, and it serves as the northern terminus of I-37. I-35 heads northeast out of the city towards the state capital, Austin. In Austin, I-35 is the Interregional Highway and has a concurrency with US 290 through Downtown Austin. Throughout Austin, elevated express lanes were constructed on either side of the original freeway. Prior to this expansion, this section included an at-grade railroad crossing, which is extremely unusual for a freeway. From Austin, I-35 goes through Round Rock, Temple, Pflugerville, and Waco. In Belton, south of Temple, it serves as the current eastern terminus for I-14. In Waco, I-35 is known as the Jack Kultgen Freeway, and begins its concurrency with US 77. The campuses of both the University of Texas at Austin and Baylor University are located adjacent to I-35. I-35 then heads to Hillsboro, where it splits into I-35W and I-35E and runs through the Dallas–Fort Worth area. The official mile markers, along with the route of US 77, follow I-35E through Dallas—I-35W, which is 85 miles (137 km) in length, carries its own mileage from Hillsboro to Denton, as though it were an x35 loop. In Dallas, I-35E is the R.L. Thornton Freeway south of I-30, which picks up the name heading east. North of I-30, it is the Stemmons Freeway. After passing through Dallas and Fort Worth, I-35's two forks branches in Denton near the University of North Texas campus. The unified Interstate then continues north to Gainesville before crossing the Red River into Oklahoma. Interstate 35 in Goldsby, Oklahoma at milemarker 102. In Oklahoma, I-35 runs from the Red River at the Texas border to the Kansas state line near Braman. It passes through or adjacent to many of the state's major cities. From south to north these cities include Ardmore, Pauls Valley, Purcell, Norman, Moore, Oklahoma City, Del City, Midwest City, Yukon, Edmond, El Reno, Guthrie, Stillwater, and Ponca City. In Downtown Oklahoma City, I-35 has a major junction with I-40 and spurs into I-235 through the north central inner city as heavy traffic follows through the city into the northern area of the state. A view from the I-35 portion of the Turnpike, between mileposts 29 and 30. Between the Oklahoma state line and Emporia, I-35 is part of the Kansas Turnpike. This section of interstate serves Wichita and passes through the Flint Hills area. At Emporia, I-35 branches off on its own alignment. 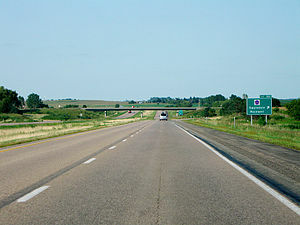 This free section of I-35 provides access to Ottawa before entering the Kansas City Metropolitan Area, where it serves Johnson County, and Kansas City, Kansas. Of note on the route, at several points between Cassoday and Emporia in the Flint Hills dirt driveways that provide direct access without a ramp, for cattle trucks, may be found in either direction along the highway. BETO Junction is a highway intersection in Coffey County, Kansas that is the intersection of U.S. Highway 75 and I-35. It derives its name from the four major cities nearest the intersection: Burlington, Emporia, Topeka, and Ottawa. It is located 16 miles (26 km) north of Burlington at exit 155. Historically, the intersection referred to as "BETO Junction" before I-35 was constructed was located on the old US 75 highway alignments 2 miles (3.2 km) south and 2 miles (3.2 km) east, near Waverly, Kansas. I-35 enters Missouri two miles (3 km) southwest of Kansas City's Central Business District as a six-lane highway. After merging with Southwest Trafficway and Broadway, it becomes eight lanes and continues north to downtown Kansas City, where it serves as the west and north legs of the downtown freeway loop. Along the north edge of the loop, I-35 joins with I-70 immediately west of Broadway and carries six lanes of traffic with a speed limit of 45 mph (72 km/h). Upon leaving the loop, Interstate 29 begins, concurrent with I-35. The two interstates cross the Missouri River together on the Bond Bridge. After crossing the river, I-29 and I-35 split. I-35 heads north to Cameron, Missouri, and then continues northward to the Iowa state line. Interstate 35 in Iowa, near Exit 182. The town of Swaledale is about one mile to the east. I-35 is part of the Avenue of the Saints between Clear Lake and St. Paul, Minnesota. A four-lane link has been completed between Clear Lake and Interstate 380 in Waterloo, Iowa. In the southern sections of the state, I-35 is parallel to U.S. Route 69 for much of its course. In Des Moines, I-35 has a 12-mile (19 km) overlap with I-80. The concurrency takes place northwest of the downtown district of the city. At exit 127 of I-80, the overlap turns east and terminates at exit 137 via an interchange with Interstate 235. North of Des Moines, I-35 is mainly parallel with US 69, traversing a vast and rural area of Iowa. Interstate 35's northern terminus is at this intersection with London Road (MN 61) in Duluth, Minnesota, with Lake Superior in the background. All of I-35 in the state of Minnesota from the Iowa state line to the city of Duluth is officially designated the Red Bull Highway, after the 34th Infantry (Red Bull) Division. At Medford, Minnesota, the on/off ramps lead to roundabouts rather than standard cross intersections. This is the first site in the state linked to a major highway to use roundabouts. I-35 splits again into I-35W and I-35E in the Minneapolis/Saint Paul, Minnesota area. The mile- and exit-numbering sequence continues along I-35E. At one sharp turn in I-35W near the junction with I-94, drivers are advised to slow to 35 mph (55 km/h) (although many drivers are able to maintain the speed limit of 55 mph (90 km/h)). Additionally, it is not possible to go from westbound I-94 to northbound I-35W, from southbound I-35W to eastbound I-94, and vice versa, without resorting to surface streets. On I-35E in Minnesota between Minnesota Highway 5 and Interstate 94, in both directions, trucks weighing more than 9,000 lbs (4,082 kg) are banned from the freeway, and the speed limit drops to 45 mph (70 km/h) but is rarely obeyed. This section was not completed until the late 1980s (although the route was cleared and graded earlier) due to opposition from the historic Crocus Hill neighborhood, which sits only a few hundred feet from the alignment. The four-lane alignment, "parkway" design was a compromise. The truck bypass for this section is signed on I-494 and I-694 to the east of Saint Paul. I-35 has an interchange with I-535/U.S. 53 in Duluth, Minnesota, known locally as the "Can of Worms". This junction features a pair of left exits from I-35, a stoplight, and lane drops over the I-35 bridge. The national northern terminus of I-35 is at an intersection in eastern Duluth. Drivers' options include merging with London Road/Minnesota Highway 61 northbound, proceeding through the stop lights onto 26th Avenue East, or turning left onto London Road southbound. Some portions of I-35 in Oklahoma City were already built in 1953, before the Interstate system was created. Through Norman, Oklahoma, the interstate opened in June 1959. In Moore, it opened in two parts: the northern half, connecting Moore to Oklahoma City, opened in January 1960. The southern half, linking it to Norman, was opened to traffic in June 1967. I-35 through Oklahoma largely parallels U.S. Route 77. This is in large part due to efforts of the towns of Wynnewood, Paoli, and Wayne, which fought to keep I-35 as close as possible to U.S. 77. This was successful due to a threat from Governor Henry Bellmon to build a toll road rather than I-35, and legislation preventing state funds for the interstate from being spent if it were more than 1-mile (1.6 km) from the U.S. route. I-35 was completed in Oklahoma in 1971, when parts of the interstate running through Carter Co. and Murray Co. were opened to traffic. The final segment of I-35 (as originally planned) to open was in north central Iowa, between Mason City and US 20 near Iowa Falls. This segment was delayed due to some controversy. Originally, I-35 was to follow the alignment of US 69 from Des Moines all the way to the Minnesota border. However, Mason City's business community lobbied for the route to be moved closer to their city. On September 1, 1965, the alignment was changed to instead parallel US 65 through northern Iowa, which brought the highway much closer to Mason City. This, however, created a long diagonal section through Wright and Franklin counties. Local farmers objected to their farms being bisected into triangular pieces, and resulting litigation delayed I-35 for several years. A November 1972 ruling rejected a lawsuit filed by the farmers, and the final segment of I-35 was allowed to proceed, eventually opening in 1975. One of the final pieces of the highway puzzle happened in Faribault, Minnesota. For approximately 25 years, Highway 35 actually went through the town and travelers had to deal with several traffic lights. In 1975, the highway went around Faribault where today a traveler actually has three exit choices for this southern Minnesota town. The Paseo Bridge over the Missouri River in Kansas City, Missouri was replaced by the dual-span cable-stayed Christopher S. Bond Bridge in December 2010. The proposed Trans-Texas Corridor toll-road project included one proposal (TTC-35) to primarily parallel I-35 from the Mexican border up to the Oklahoma border. There are major disagreements as to what impact this parallel route would have on I-35 in terms of traffic, maintenance, and commerce. The Trans-Texas Corridor was first proposed by Texas Governor Rick Perry in 2002. It consisted of a 1,200 foot (366 m) wide highway that also carried utilities such as electricity, petroleum and water as well as railway track and fiber-optic cables. In July 2007, U.S. Representative Duncan Hunter successfully offered an amendment to House Resolution 3074, the FY2008 Transportation Appropriations Act, prohibiting the use of federal funds for Department of Transportation participation in the activities of the Security and Prosperity Partnership of North America (SPP). Hunter stated that: "Unfortunately, very little is known about the NAFTA Super Highway. This amendment will provide Congress the opportunity to exercise oversight of the highway, which remains a subject of question and uncertainty, and ensure that our safety and security will not be compromised in order to promote the business interests of our neighbors." Fellow Republican Congressman and presidential candidate Ron Paul brought the issue to mainstream prominence during the December 2007 CNN-YouTube GOP debate, where he rejected the concept and also called it the NAFTA Superhighway after the North American Free Trade Agreement and, like Hunter, framed it within the ultimate goal of creating a North American Union. US 83 in Laredo; the highways travel concurrently to Botines, approx. 18 miles (29 km) north. I‑10 / US 87 / US 90 in San Antonio. I-10/I-35/US 87 travels concurrently through Downtown San Antonio. I‑410 on the San Antonio–Windcrest city line; concurrency for three miles (4.8 km). US 290 in Austin; the highways travel concurrently through Austin. I‑14 / US 190 in Belton; US 190 travels concurrently to Temple. US 77 in Waco; the highways travel concurrently to northeast of Hillsboro; follows route of I-35E afterwards. US 77 in Denton; the highways travel concurrently to south of Thackerville, Oklahoma. US 70 in Ardmore; the highways travel concurrently through Ardmore. US 77 in Norman; the highways travel concurrently to Oklahoma City. I‑240 / US 62 in Oklahoma City; I-35/US 62 travels concurrently through Oklahoma City. I‑40 / I‑235 / US 77 / US 270 in Oklahoma City; I-35/I-40/US 270 travels concurrently through Oklahoma City. I‑44 in Oklahoma City; the highways travel concurrently through Oklahoma City. US 77 in Edmond; the highways travel concurrently to Guthrie. US 64 in Perry; the highways travel concurrently to north-northwest of Perry. US 50 east of Emporia; the highways travel concurrently to Lenexa. US 59 in Ottawa; the highways travel concurrently to east-northeast of Ottawa. US 56 in Gardner; the highways travel concurrently to Merriam. US 169 in Olathe; the highways travel concurrently to Merriam. US 69 in Lenexa; the highways travel concurrently to Merriam. I‑635 / US 69 in Mission; I-35/US 69 travels concurrently to Kansas City. I‑70 / US 24 / US 40 / US 169 in Kansas City; the highways travel concurrently through Kansas City. I‑29 / I‑70 / US 40 / US 71 in Kansas City; I-29/I-35/US 71 travels concurrently through Kansas City. US 69 in Pleasant Valley; the highways travel concurrently to Liberty. I‑80 / I‑235 in West Des Moines; I-35/I-80 travels concurrently to Ankeny. US 18 south-southeast of Clear Lake; the highways travel concurrently to Clear Lake. US 2 in Duluth; the highways travel concurrently through Duluth. ^ Gyure, Joseph. "Interstate 35 dramatically changed Waco's face". Waco Tribune-Herald. Archived from the original on January 12, 2006. Retrieved January 10, 2006. ^ Staff (October 31, 2002). "Table 1: Main Routes of the Dwight D. Eisenhower National System Of Interstate and Defense Highways as of October 31, 2002". Route Log and Finder List. Federal Highway Administration. Retrieved March 28, 2007. ^ Google (February 15, 2008). "overview map of I-35" (Map). Google Maps. Google. Retrieved February 15, 2008. ^ Texas Official Travel Map (Map). Cartography by TxDOT. Texas Department of Transportation. 2006. ^ Bear, Jacci Howard. "Are Interstate Highway 35 and Interregional Highway 35 the Same Road?". About.com. Archived from the original on December 7, 2008. Retrieved December 7, 2006. ^ Motor Carriers' Road Atlas (Map) (Deluxe ed.). Rand McNally. 2007. p. 38. ^ Staff (September 2004). "Excellence in Highway Design 2004". Focus: Accelerating Infrastructure Innovations. Federal Highway Administration. 21 (8). ISSN 1060-6637. FHWA-HRT-04-029. Archived from the original on June 10, 2010. Retrieved February 12, 2006. ^ Google (June 8, 2009). "overview map and aerial photo of the Can of Worms interchange" (Map). Google Maps. Google. Retrieved June 8, 2009. ^ a b Cockerell, Penny (June 29, 2006). "50 Years: As the intersection of Interstates 35, 40, and 44, Oklahoma is at America's crossroads". The Daily Oklahoman. Oklahoma City. p. 2A. ^ Medley, Robert (June 29, 2006). "Highways continue to drive economy". The Daily Oklahoman. Oklahoma City. p. 1D. ^ Jansen, Meghan (December 17, 2010). "All Interstate 29/35 Ramps and Lanes Open Tomorrow: On-Budget and Six Months Ahead of Schedule" (Press release). Missouri Department of Transportation. Retrieved November 27, 2011. ^ "I-35 Corridor Section". Trans-Texas Corridor Study. Archived from the original on May 9, 2007. ^ Kovach, Gretel (December 10, 2007). "Highway to Hell?". Newsweek. Retrieved December 7, 2007. ^ Kasper, Joe (July 25, 2007). "Hunter NAFTA Super Highway Amendment Passes House" (Press release). Office of Congressman Duncan Hunter. Archived from the original on December 21, 2008. ^ "Texas Legislature Online - 82(R) History for HB 1201". Texas Legislature. Retrieved January 28, 2013. ^ "Texas Legislature Online - 82(R) Text for HB 1201" (PDF). Texas Legislature. Retrieved August 13, 2013. Wikimedia Commons has media related to Interstate 35. Kansas City Star's "I-35 Odyssey, A Summer Travel Series"